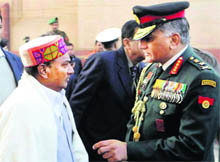 The government today had a tough time defending Defence Minister AK Antony�s decision to treat Army Chief Gen VK Singh�s date of birth (DoB) as May 10, 1950 and not as May 10, 1951. The Ministry of Defence today began consultations on its options following the queries posed by the Supreme Court today in the Army Chief�s case over discrepancies in his date of birth. A day after being rapped by the Supreme Court and told to auction the 2G spectrum allocated in 2008, the Telecom Regulatory Authority of India (TRAI) today started the process by seeking the views of all stakeholders by February 15. Directed to complete the process within four months, TRAI said the deadline would not be extended. Nearly 48 hours after Moga DSP Balraj Singh Gill and Monica Kapila, wife of an industrialist, were found dead at a farmhouse on Hambran road here yesterday, the police is still groping in the dark. 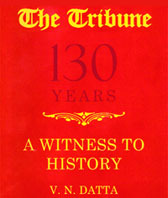 The probe, so far, has indicated that the cop and the woman reached the farmhouse separately. The DSP was the first to reach the farmhouse and invited Monica. 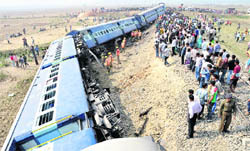 Three persons were killed and over 50 injured - 16 of them seriously - when five coaches of a passenger train derailed after hitting an earth-carrying vehicle (dumper) at an unmanned railway crossing. Regretting that the Lokpal and the Lokayukta Bill could not be passed in Parliament during the Winter Session, Prime Minister Manmohan Singh today expressed the hope the country would soon be able to enact a strong Lokpal law to combat corruption. India lifted their game and by winning the second of the two T20 matches, they also lifted the spirits of their die hard supporters. The win was all the more remarkable as it came on the back of some excellent fielding which has not always been India�s strong point in international cricket.